Until 2012, the Isle of Man’s Manx Grand Prix incorporated events for classic motorcycles, although they didn’t attract that much attention beyond the races’ devotees. Then TT boss Paul Phillips had the simple yet brilliant idea of rebranding the races as the Classic TT. The quality and variety of machinery soared, heroes of the modern TT races clamoured to get rides on long-obsolete designs, and the outside world began to take notice. Now, in just its third year of existence under its new name, the Classic TT has become the best motorcycle race of 2015. That’s a big statement, but it’s justified if you like to see a grid full of wildly different technical approaches to the challenge of getting to the chequered flag first. During the Classic TT’s ten days of practising and racing, the Island will be metal heaven. Just look at the entry in the Formula 1 race: big Japanese superbikes - Suzukis, Kawasakis and Yamahas - competing against a Yamaha YZR500 V4 two-stroke grand prix bike, and a Norton Rotary of the type that won the 1992 Senior TT in the hands of Steve Hislop. The grid for the 500cc race is even more eclectic. In this 151-mile contest, single-cylinder bikes are allowed to pound down the Glencrutchery Road four times, straight through. If your bike has more than one lung, however, you have to pit once for fuel. So you’ve got top runners such as Michael Rutter, Michael Dunlop, Ivan Linton, Dan Cooper and Steve Linsdell hoping to retain enough of a lead as they swoop down the Mountain for the last time to be able to hold off a pursuing pack of twins, triples and fours. The Classic TT is not just about the metal. The races also seethe with great personalities and huge passions. Take the situation of Michael Dunlop. The TT’s wild child has cycled through five manufacturers in as many years - but in the Classic TT he nests every year with Steve Wheatman’s Classic Team Suzuki. Dunlop walked out of the Milwaukee Yamaha squad halfway through practice week for the TT in June (and presumably severed all relationships with one of global racing’s big two manufacturers), yet his experiences on Wheatman’s 1216cc Suzuki XR69 haven’t been entirely trouble-free. In 2011 the XR69 put a rod through the cases at around 120mph at the Verandah, and cast Dunlop down the road, and last year he retired early from the Formula 1 race with an electrical fault. Yet despite these incidents - which can happen to even the best-equipped factory teams - Dunlop has a warm relationship with Wheatman’s crew. Now, in the Classic TT, he has his only chance of taking a Mountain Circuit victory in 2015. He’s going to be on it. Can Bruce Anstey defend his Formula 1 win of last year on Clive Padgett’s Yamaha YZR500? Most of the bikes on the grid are replicas of original designs, but the Padgett bike is an authentic 1992 machine, apart from components changed for safety reasons (magnesium handlebars and clamps replaced with aluminium). It’s also giving away up to 750cc to rival machinery. It’s mad, they can’t possibly do it - but Anstey set the absolute classic record at 123.894mph in his victory ride last year, and reckons there could be a 128mph lap lurking in this V4 two-stroke. Dunlop and Anstey appear to be the favourites for this year’s F1 race. But two of the modern TT’s fast-rising stars, James Hillier and Peter Hickman, are mounted on Kawasaki ZXR750s and will want to upset the duopoly. Hillier’s Greenall Racing bike was fastest through the Sulby Straight speed trap last year at 173.41mph (against Anstey’s second-fastest 171.19mph). Winfield Racing owner Roger Winfield relies on air-cooled Yamaha XJ1200 engines because water-cooled motors would make him ineligible for his other big love, the Phillip Island Classic in Australia. But despite this apparent disadvantage, Ryan Farquhar was third fastest at Sulby on a Winfield Harris-Yamaha last year at 169.61mph - and the team also fields John McGuinness, who burst back to top island form in June by winning the Senior TT. 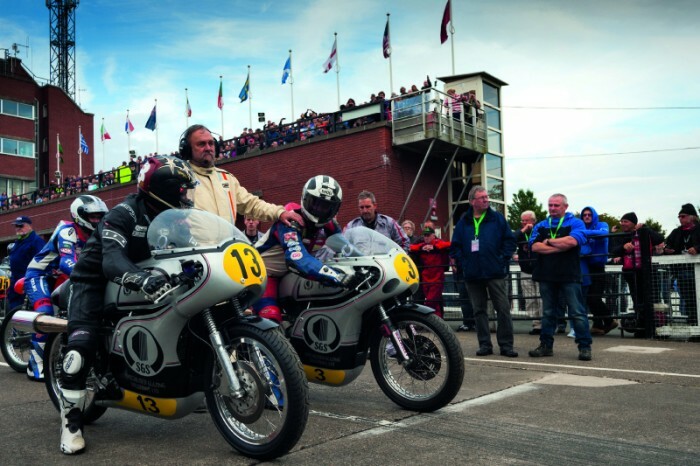 Could all these piston-engined bikes be toppled by the Norton Rotary, entered by the National Motorcycle Museum, fettled by the rotary engineer Brian Crighton, and ridden by William Dunlop? This is a bike similar to the Rotary on which Steve Hislop won the 1992 Senior TT. It’s the team’s debut appearance at the Classic TT, and their potential is unknown, but the Rotary, both searingly fast and problematic, could be a leaderboard runner. The Classic TT tech-feast reaches its climax in the 500cc race. Look at this: Paton twins v Honda fours v Brit singles v MV triples. And as if that drama were not great enough, there are sub-plots among the Brit singles entrants. The conventional Matchless G50 and Manx Norton two-valvers also have to compete against the four-valve Manxes, and this year for the first time the four-valve G50, thrown into the mix by the inventive mind of singles manufacturer Andy Molnar. Both two-valve and four-valve factions will be fighting to set the first 110mph lap of the Mountain Circuit by a classic single. Michael Rutter currently holds that mark at 109.102mph, set last year on Ripley Land Racing’s G50, it’s two-valve engine breathed on by wizard Fred Walmsley. The retirement rate is often embarrassingly high in this race, but team owners are tuning their kit to the limit in a frenzied bid to win. But can more bike builders learn the key to that elusive combination of speed and durability? Based on their previous form in this race, the Patons start as favourites, especially with two of them being handled by John McGuinness, and last year’s race winner Ian Lougher. But Dan Cooper was leading into the last lap in 2014 on a Molnar Manx Norton, and the ultra-competitive Andy Molnar, always up for a bust-up with someone, will surely have squeezed more speed from his singles. Young stars of the modern TT are flocking to the Classic version, as shown by the 26-year-olds Lee Johnston and Dean Harrison, who will ride MVs for the Kay family’s Black Eagle Racing team. The Kays - grandpa David, middle one Mark, and grandson, and son of Mark, 22-year-old Mitchell - build these replicas of classic-era Agostini and Read machines in the workshops behind their house in the West Midlands. They shun modern-era CNC manufacturing techniques, and create their bikes in the MV way from castings and machinings. Yet they proved last year that they can build fast and tough bikes. Lee Johnston revved his Ago-rep triple hard, and won the race against all odds. The MVs are pitched against a horde of Honda twins. These bikes are based on the 350cc K4 road machine, and such bikes were not raced in the classic period. But today they make an inexpensive and durable entry to classic sport, with Davies Motorsport being in effect, the factory team. The single-cylinder contingent will probably have a harder time getting onto the podium in this race. Island veteran Bill Swallow adds to the variety by competing on an Italian Aermacchi horizontal single, a popular privateer’s choice in the sixties. It’s as diverse a choice of motorcycles you’re likely to find anywhere at a racing festival in the world, and with each passing year the Classic TT grows in stature. You need only look at the entry list to see that. There is only one period in the 66-year history of grand prix racing that can rival the variety of machinery that you’ll find if you wander round the Classic TT paddock - the years of the Japanese tech-wars in the sixties. Honda played with everything from one to six cylinders, passing through twins, fours and fives. Yamaha built twins, and V4s in 125cc and 250cc configurations. Suzuki had 50 and 125cc twins and a 250cc square four. MV defended with its triples (the fours came in the seventies), Jawa pitched in with a 350cc V4 two-stroke, and there were Morini singles’, Benelli fours, a Bianchi 350cc twin and MZ’s two-stroke singles and twins. Private runners in the bigger classes punted round for pitiful start money on the Brit singles. The Classic TT doesn’t pretend to be a replay of those times. Instead it has some of those sounds, plus big brutes of the early superbike years. There is nowhere else where you can find that kind of mix.